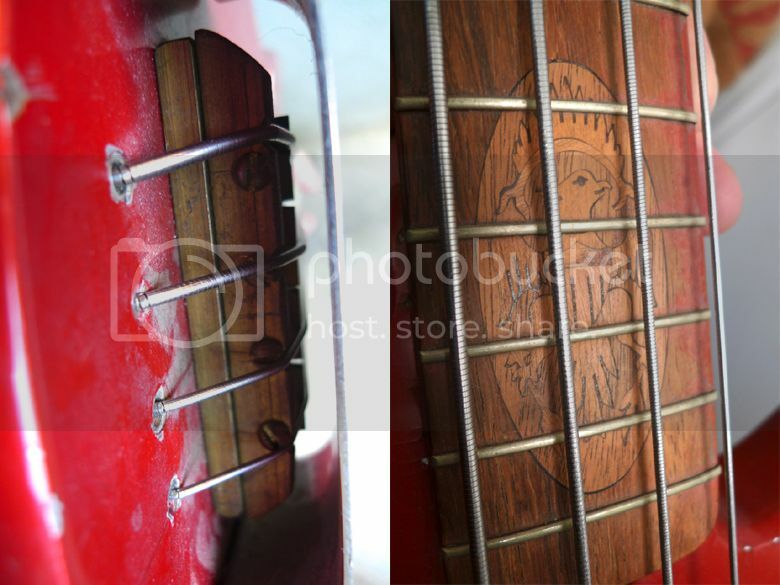 Guitar Blog: Can you identify the mystery bass guitar from the 1960s? 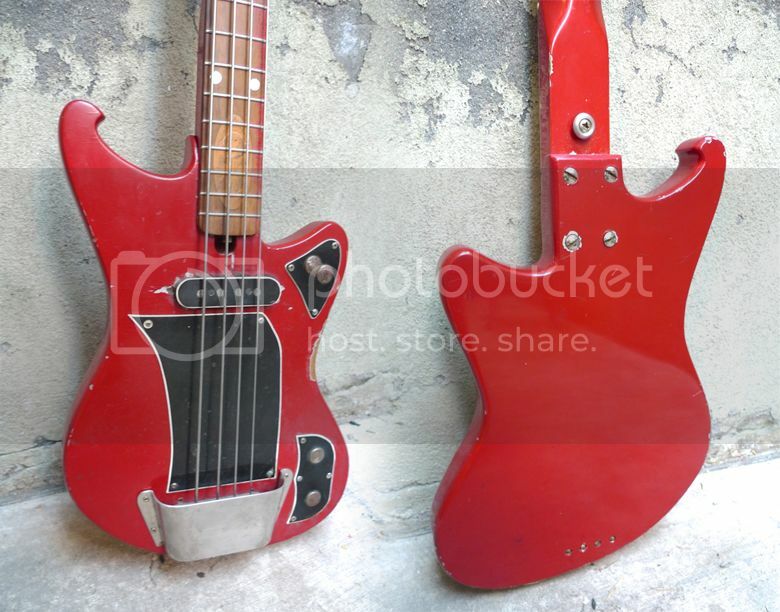 Can you identify the mystery bass guitar from the 1960s? Can any of our readers identify this mystery bass currently listed on eBay? I'd guess that it was from the 1960s - it's certainly no later than that decade. Note that it has a single pickup mounted near the neck, tapewound strings, and a cover over the bridge; all features that help date the instrument. It also appears to be a long-scale bass (note length of the neck and the position of the bridge at the very rear of the body). However, in the photo of the backside of the instrument the rear of the top end of the neck (i.e. nearest the body) has an unnecessarily extended square cross-section. You'd expect the square section where the neck is mounted into the body's neck pocket, but it seems odd that it wasn't carved around the area of the top frets. I can only assume that no-one expected a bass player to venture so high up the neck when this bass was built, although in that case you have to question the decision to have a cutaway body shape in the first place (probably an aesthetic choice rather than one of practicality). One very distinctive feature is the coat of arms inlaid into the fingerboard. Does this ring any bells with anyone reading this? Currently listed on eBay with a Buy It Now price of $650. Thanks to Kalle for briging this bass to my attention via our Facebook page. Labels: bass, vintage guitars, What's that guitar? headstock's so clumsy that it says one-off to me. It may be my overactive imagination, But it looks like the head has been repainted with a duller red, and I can almost read the Egmond name badge bleeding through. I think you are right about the headstock being painted over. I downloaded the picture of the front of the headstock and played about with contrast and sharpness and I can make out a small eagle on the end and also thought I could just make out the name "Eagle". I googled "Eagle guitars" and "Eagle bass" and got lots of B.C. Rich stuff and a modern company called Eagle Guitars, but nothing from the 60s or 70s and nothing remotely resembling this bass. My guess is it's probably a customised instrument from a small European manufacturer, it looks more East European than Japanese to me (but I could be wrong). I have a cheap 1970s Japanese bass with the same tuners and bar thing on the headstock. My money's on it being homemade. The inlay is awesome though, and due to it being far better looking than the rest of the bass, I'm thinking that the peice of wood used for the fretboard used to be part of an old peice of furniture and it already had the inlay on it? I would guess it was either home-made or custom built by a small time luthier or something. I really like the coat of arms.